OLG has another promotion on for the NHL lotto where you can get a free ticket to play. I love the promotions! Make sure to get your free play for NHL lotto ticket. You have a chance to instantly win plus a chance to win in the nightly draw. Take your coupon to your local retailer. Your NHL®team is represented by the shooting player on screen and also appears on your ticket for the nightly draw. 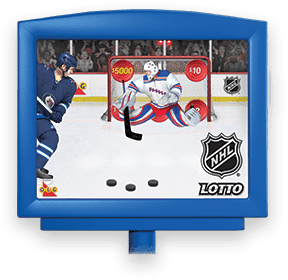 WATCH THE SCREEN - Watch the lottery terminal screen to see your player take 3 shots at prize targets in the net. If your player hits a target you win the prize and each prize target your player hits adds to the total prize. CHECK YOUR TICKET - Check your ticket after the nightly draw to see if you've matched your NHL® team and/or Lotto Numbers. One coupon per person. Users attempting to circumvent this rule will have their coupons invalidated, and may be subject to criminal prosecution.